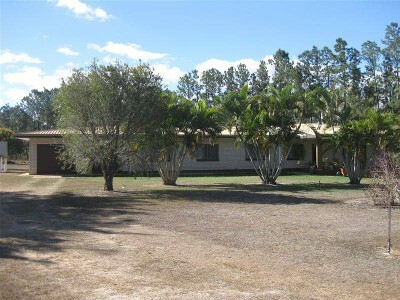 Sit back and relax on this well maintained farm style property and gaze over your 175 acres of land. A huge 4 bedroom home presents its self proudly on the lush green grass surrounded by palms. The home is equipped with two bathrooms (1 in garage) and two kitchens, in which 1 kitchen is commercial and all stainless steel appliances and benches. High ceilings, double brick surrounding walls, front patio and wide hall ways are just a few features for this home. You will also find a double garage and large separate dining and lounge rooms. Also on this property are 500 mango trees, 50 mandarin trees, 25 lychee trees in which are all watered by a 6 cylinder Perkins motor and pump via underground PVC mains. Shed space aplenty, large shed to fit all machinery and more, with separate storage rooms and tractor shelter + liveable unit on shed. 3 phase power, 70 mgl water license, fine sand deposits, a second liveable 2bedroom farmhouse, tractor with forklift, fiat 880 cab tractor, zero turn mower, spare 4-6inch aluminium pipes and much more on this 70 hectare farm. Please enquire for more information. "The sustainability declaration for this property is available from the Office upon request"